Actually this is a double accordion. An accordion book is one sheet of paper, encased by two book board covers, folded like an accordion between. For this little experimental book, I took two folded accordions, slit each page vertically to its midpoint, and then scissored them together to create this diamond effect. The book can be opened from both sides, and has the additional awesome factor of an inside space, kind of hidden pages. The covers wrap around and clasp at either end to make a nice package. Sorry updates have been kind of slow and all book-related recently. I usually try to mix up the mediums that I write about for interest's sake. Right now I'm working on a backlog of photos I took last semester, since the school year ended in May. I've been pretty busy with summer fun and trying to find a real job while scraping by on part-time or one-off gigs. I still have a comic in the works, as well as a couple things I haven't scanned or photographed yet (including - yes - more books!) And just this weekend another project of mine came into fruition. I had a series of works about Llama Man installed at the IASD Dream Art Exhibition, including Llama Man himself (the costume posed on a freestanding armature I created for the exhibit). My film, For My Psychopomp, was installed as a loop on an old TV I got at a thrift store. I got a lot of really great feedback from a community I was incredibly happy to show my artwork to. People were really interested in the dream and how I've worked with it over the years, as well as in awe of Llama Man's towering and terrifying figure. Sunday night was the reception, and I won first prize in the Nancy Richter Brzeski Dream Art Awards! Now I have some money to buy more film to make more creepy movies. Yes! I am so excited and honored to have been recieved in such a wonderful way, and win such a great prize. Thanks IASD! More from last semester's artists books class. This is called coptic binding, and uses multiple signatures (groups of pages). I triple wrapped the thread each time I came to the head or tail of the spine to create the thicker number of lines there. I also made a cover for this book, out of cardstock and bookcloth, and colored paper for the inside cover. Here are two of the books I made at the beginning of last semester in my bookmaking class, while we were learning the pamphlet stitch. The pamphlet stitch is one of the simplest bookmaking techniques, and I've used it before in both of these. You can see in this second one that I've also included a tab on the back cover that folds over the front cover to clasp shut the book. Very cute and simple. These books were made out of recycled and found paper. These are sketchbook pages wherein I've been working on the design for the characters who inhabit my newest comic. 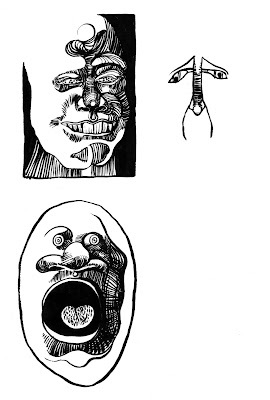 They're called 'squishsacks', and they travel in a jellyship. 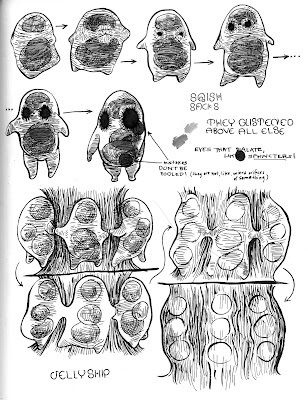 They're bloblike aliens composed mainly of fluid containing their and their species' genetic information. 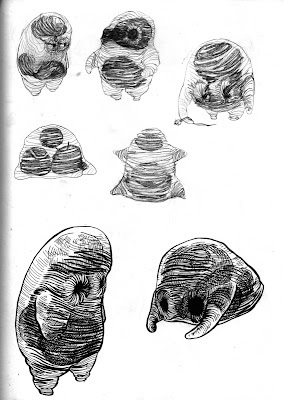 They have three sacks inside of their main body sack which contain only their own genetic information, and they can come together like soap bubbles to communicate through a fluid exchange. They can also meld into the jellyship, a completely organic spaceship shaped like a jellyfish doughnut, which propels through space by manipulation of its many tenticles. Here are some photos documenting the making of my final film for the semester. Most of them are from the super 8 shoot, which happened in early March in the Chicago Forest Preserve and on Montrose Beach. Mark and AJ helped me out with this part, AJ working the camera and Mark helping me get my costume on and off and move stuff around. At first we were having a really difficult time as it had rained the previous day, so these big fields we were in were very muddy and my stilts got caught in the ground. This is a disaster for anyone who knows how to stiltwalk; because you have no ankles or toes on the bottom of your 'feet', you must keep in constant motion to stay balanced, and that is impossible if your legs are glued to the ground. We finally had to find places for me to walk on concrete drains or paths, with a natural background to make it appear as though Llama Man were walking on the grass. This is why, in the film, you'll see that his feet are cut off in several shots. AJ did really well considering he didn't know that much about film or shooting film. We'd frame shots together and then I would yell at him through my mask how many seconds I wanted him to roll. The time was around lunch, and there were lots of working men on their breaks, eating in parked cars and watching us. Llama Man must have looked really bizarre to them, especially since this girl kept emerging from behind the mask. I would wave at them in costume as often as possible, and usually they were good sports about it and waved back. A couple cops stopped to ask what we were doing, if we were shooting a horror film. I said yes because I didn't really want to launch into the whole explaination. The shoot for the 16mm stuff was way different and much harder. Most of the time was spent constructing the set.